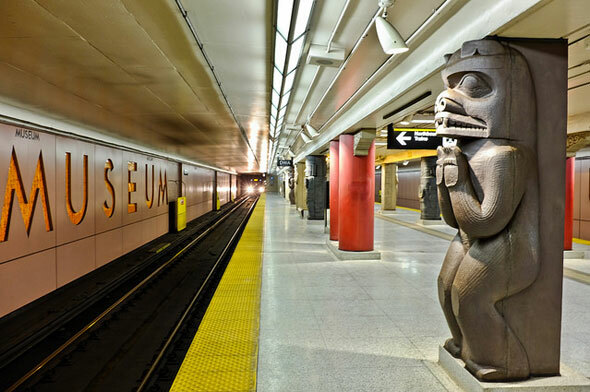 You might not know it, but parts of the Toronto subway double as an art gallery. Take a moment to explore, and you'll find intricate glass mosaics, angular aluminium sculptures, even optical illusions etched into the walls. 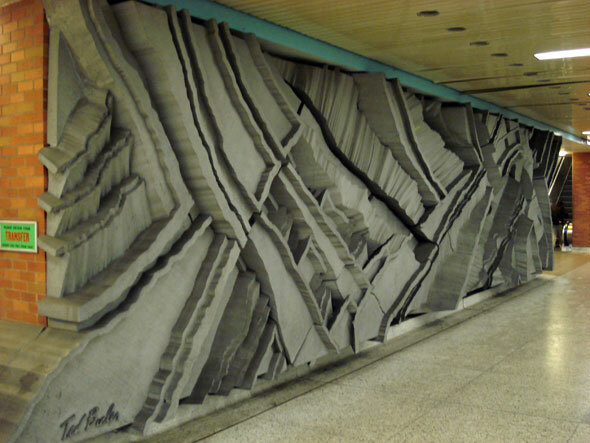 The majority of public artwork on the TTC is to be found inside stations built since the 1970s. Before decorative adornments became a standard part of station budgets, Toronto's subway stops were sparsely furnished. Glossy wall tiles, which on the original Yonge and Bloor-Danforth lines followed a repeating pattern, were the main source of colour. When the stations were retrofitted over the years, some received artistic additions, like the now iconic Hockey Knights in Canada by Charles Pachter at College and John Boyle's murals at Queen. The Spadina section of Line 1 and the Sheppard subway were the first to be built with artistic flourishes from the get go. Continuing that tradition, the budget for the soon-to-be-completed Spadina extension includes a $3 million art fund to be split between the six new stations. 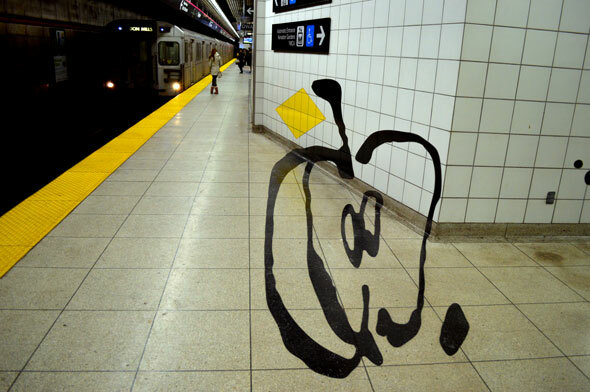 Here's a short guide to the best art on the Toronto subway. Cave-like Dupont is really a functional artwork that doubles as a subway station. Designed by Dunlop-Farrow Architects, the rounded interior of the station is covered in millions of circular, earth-coloured tiles, giving the place a vaguely mediterranean feel. Writer Shawn Micallef called it a "subterranean 1970s fantasy land" in his book Stroll: Psychogeographic Walking Tours of Toronto. At track level, two glass flower mosaics by James Sutherland, titled Spadina Summer Under All Season, face each other. Back on the street, take note of the giant interlocking doors on the northwest corner. Sculptor Ron Baird built them to hide an unsightly transformer. Toronto artist Panya Clark Espinal's 24 playful tile decorations at Bayview station--titled "From Here Right Now"--only reveal themselves when viewed from the correct angle. To create the disorientating effect, Clark Espinal projected her sketches against the walls of a 3D computer model of the station. The resulting patterns were printed on the floor and wall tiles and installed in 2002. "The image appears distorted when seen from a frontal position but when viewed from one side or from an angle it resumes normal proportions," the artist explains on her website. A ladder, stopwatch, umbrella, stairs, and other everyday objects are scattered across the station, even on the platform. Located on the mezzanine level between the subway platforms and the street, the textured aluminium surface of Ted Bieler's Canyons just begs to be touched. Installed in 1978 at what was then the terminus of the Spadina line, the piece makes the station look as though it were carved out of slate. Bieler, a York University professor, is also responsible for Triad, a three-pronged triangular design outside Citigroup Place at Front and University, and Wave Breaking, a bronze sculpture that was installed at the Canadian embassy in Japan in 1990. Before it was extensively made over to look like its namesake in 2008, Museum was home to one of the best preserved TTC station interiors from the 1960s. The $5 million update by Diamond and Schmitt Architects matched the station's supporting columns to artifacts in the collection of the Royal Ontario Museum: a First Nations' house post, a figure of Egyptian god Osiris, Forbidden City and Doric columns from ancient Greece. Two giant metal station signs include hidden hieroglyphs. The renovation was supposed to be the first in a series of three--St. Patrick and Osgoode were due to follow--but the funding for those projects dried up. Stacey Spiegel's pixelated Immersion Land dominates the Sheppard line level of the station. 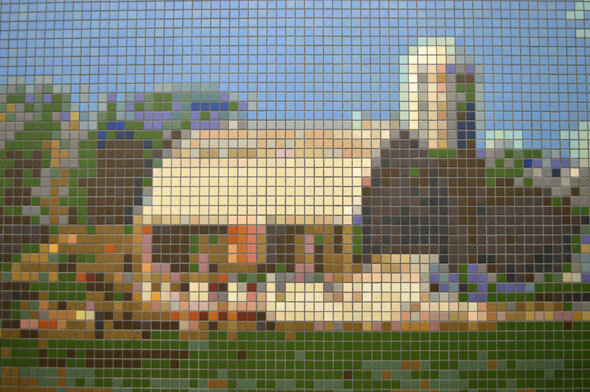 The rural scene, rendered using millions of individual coloured tiles, covers the walls of the east and westbound platforms. Up close, the effect is dizzying, like sitting too close to the TV. Ian Chodikoff in Canadian Architect writes that Spiegel's piece "suggests a displaced landscape of nostalgia and one of an imagined farmland that might have existed several metres above the transit platform before succumbing to the inexorable urban sprawl and development." 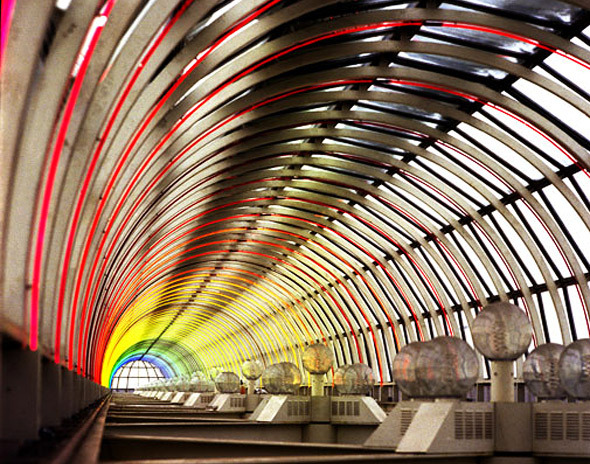 Yorkdale station was home to arguably one of the most beautiful art installations on the Toronto subway, Michael Hayden's Arc en Ciel. 158 multi-coloured neon lamps attached to the ribs of the platform roof would change colour as trains arrived at the station, producing a dazzling moving rainbow effect. Unfortunately, a minor design flaw allowed water to collect near the transformers that controlled each of the bulbs, and one by one they burned out. Instead of spending the $28 to fix each of the blown transformers, the TTC took the $100,000 piece down in the mid-1990s. In 2010, there appeared to be a plan to bring back the Arc en Ciel, but that has since fallen through. Images: Chris Bateman/blogTO, Howard Yang, Dan...Mr Dan/blogTO Flickr pool, Eja2k/public domain via Wikimedia Commons.